Alice Walker is one of the few living writers whose work regularly appears in the high school curriculum. While she is known primarily for her best-selling novel and masterpiece The Color Purple, many of her other novels, essays, and poems are favorites of both students and teachers alike. In 1983 she became the first African-American woman to win the Pulitzer Prize for fiction. 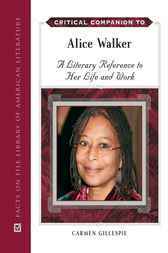 Critical Companion to Alice Walker is a one-stop resource for anyone interested in this prolific author's life, works, and achievements.